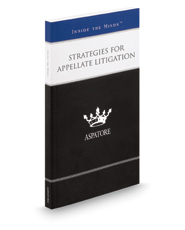 Strategies for Appellate Litigation provides an authoritative, insider's perspective on the not-so-subtle differences between trial and appellate practice and the key strategies for winning cases on appeal. Appellate litigation experts from across the nation guide the reader through the process of successfully preserving the record at the trial court level and fleshing out a strong theme of argument that comes to life in the appellate brief. These professionals offer insights from a number of subject-matter perspectives and discuss the importance of addressing on appeal only the most relevant arguments. The different niches represented and the breadth of perspectives presented enable readers to get inside some of the great minds of today, as these experienced professionals offer up their thoughts on the keys to success within this high stakes practice area.